For the eternal bond of love that you share with your brother, celebrate the same bringing countless smiles on your brother's face by sending scintillating Rakhi to Zirakpur and making the moment for him memorable and cherishable. Zirakpur, a developing town in Mohali District, Punjab near Chandigarh is one of India’s hottest emerging towns. Zirakpur got its name from a small Zirakpur village which is now a part of Zirakpur town. While you have fond memories of Zirakpur and wish to visit the beautiful city on this upcoming Rakshabandhan but unfortunately, cannot do so due to your hectic life, you still have an option to celebrate the occasion with your brother by sending beautiful Rakhis to Zirakpur through FlowerAura. Rakshabandhan is an occasion that celebrates the eternal bond of love between a brother and a sister. No matter how old you grow up, there’s one person you would always count on- that’s your sibling. Therefore, celebrate that bond. This Rakshabandhan, make sure you celebrate the occasion with utmost spirit and fervour. With FlowerAura’s Rakhi gifts delivery to Zirakpur, send all your warmth to your brother through FlowerAura and make your presence felt despite being miles away. Absence makes the heart grow fonder. This statement holds true when you are away from your loved ones. As you grow up, you move to some other city, away from your family and fail to be present on each and every event with them. Now, you can count on FlowerAura where you can avail an option of sending Rakhi and sweets online for brother along with free shipping. But do you think that’s all? Well, not so! Because there’s a lot more that Floweraura has brought for you to bring ease and comfort to its customers. Now, you can opt for same day Rakhi delivery to Zirakpur to your dear brother. You need not worry about the delay in delivery as Floweraura assures you instant delivery if you haven’t been able to make it to the city on this love-filled occasion. 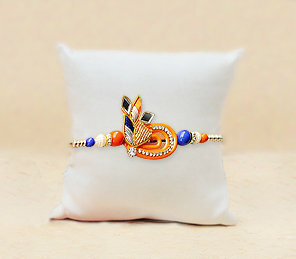 So the next time you are wishing to send Rakhi to Zirakpur to your brother and looking for a reliable gift portal to deliver your tokens of affection, count on FlowerAura, your Messenger of Emotions that assures you quality coming along with home delivery of Rakhi in Zirakpur and express your emotions despite being miles away.